Compliant with ExpressCard Specification 1.0. Compliant with 1-Lane(x1) PCI-Express with transfer rate 2.5Gbps throughput. Compliant with ExpressCard/34mm standard. 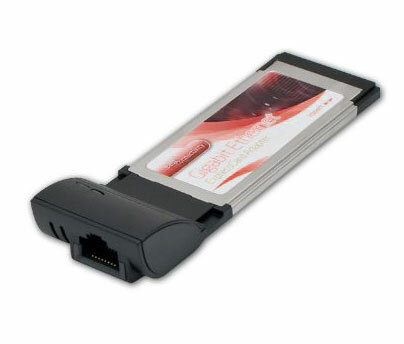 Compatible with standard 34mm & 54mm ExpressCard slot. Compliant with IEEE 802.3. 802.3ab. 802.3u. 802.3x. 802.1q. VLAN. 10/100/1000M data transfer rate auto-negotiation. Automatic crossover detection and correction supported. One end is RJ-45 female connector and another end is standard ExpressCard 34mm. LEDs indicates the status of data transfer. Plug & play and hot swapping capability. Bus-powered mode and no external power required. Support Windows 98/98SE/ME/NT/2000/XP/Vista/Server 2003/Win7 & Mac OS & Linux.